Kat, a photo by Bruce M Walker on Flickr. Jewelry designer Kat Shura of Curious Oddities at Artisans of the Metropolis. So recently I got it in mind to do some figure work, against a completely black background. But I also decided to create more shape definition by outlining my model with light. I had been studying Maxim-style glamour shots lately and love the kind of 3D look that they achieve. I learned that glamour photographers will often use a couple of strip banks, usually gridded, on the left and right of the subject to get that desirable rim light. Unfortunately I also discovered that gridded strip banks are not cheap, even eBay knock-offs. If my budget had allowed, I would have bought a couple of Westcott Apollo strip banks -- they're very nice. So I thought about what I could do to get the cost down and still achieve the look I wanted. Well first of all, I needed a couple of extra light sources. Since I still needed to front-light my subject, that meant I would need a total of three flashes in my setup. I have two very good ones (full-featured Pentax AF540FGZ pTTL flashes) so I just needed one or two simple, dumb flashes. There are a few decent choices available right now, but the one that seems to be at the sweet spot for capabilities and price is the Neewer TT560. It tilts 90 degrees, swivels 360 degrees, its power adjusts over an 8 stop range, it supports optical slave modes, and best of all it's less than $50. The biggest negative compared to the more expensive and popular Yongnuo's is it has no zoom capability. 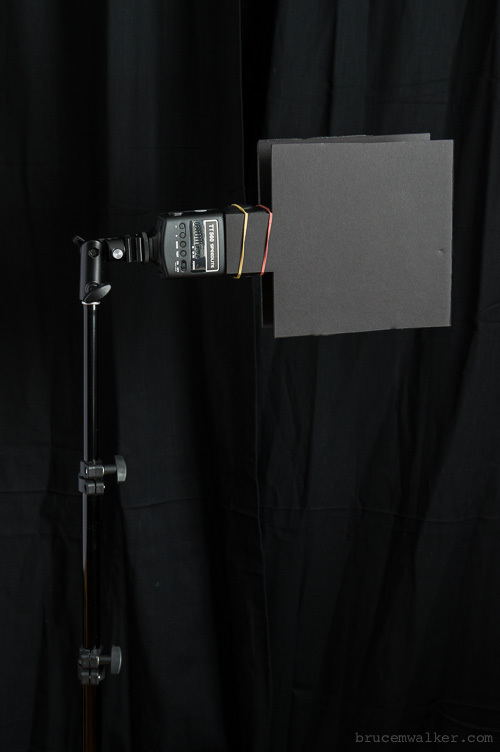 But I'd be using it as a wide angle source, either inside softboxes and umbrellas, or else bare as my rim light source. I ordered two from Amazon and received them a few days later. Now I needed to shape this light. One requirement in rim lighting is to get it onto the subject while avoiding getting it onto the background (which I want to keep black) or allowing it to flare into the camera's lens. That's why a gridded strip bank is a good choice: the light is contained and focussed within a narrow side-to-side angle, like 40 degrees, yet applied evenly over the vertical reach of the subject. But there's another way to do this, and we borrow it from stage lighting: Barn Doors. 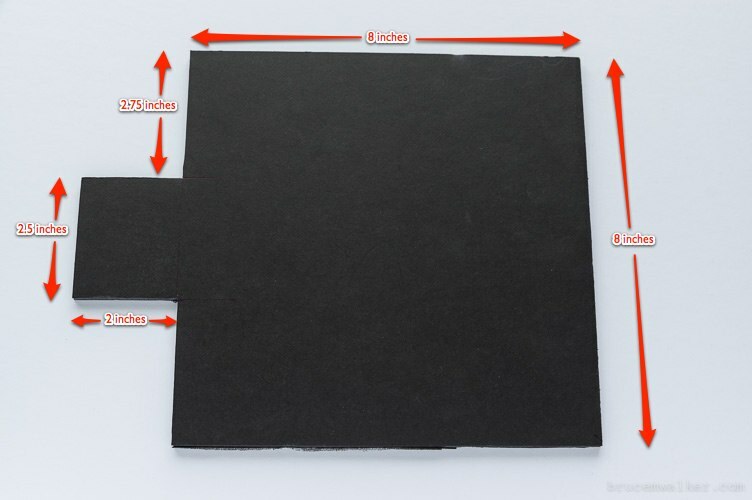 These are generally steel plates painted flat black which can be adjusted on four sides of a light to contain the output inside a box shape. It's a bit like an adjustable square snoot. You can purchase fabric snoots from a couple of vendors, eg the Honl line, and I have one, but a snoot contains the light into a small circular shape while I wanted to make it a vertical stripe. Nobody seems to have barn doors for hotshoe flashes, so I figured that I would go the DIY route and create them from scratch. One dollar? Yup: a hunk of black foam core from the nearby dollar store. I was able to cut all four of my barn doors (two for each flash) from one 20"x30" piece. I just used a box cutter and a steel rule to guide my cuts. I did the cutting on a self-healing plastic mat from the artist's supply. So how did I do? Very well indeed! I got just the look I was after. Eugenya, my art/life model, held a pose while I adjusted the direction of the two rim lights to just graze her body from about 30 degrees behind on either side. My main light was a third flash inside a Westcott 28" Apollo with 40 degree grid that I boomed above and in front of her, just feathering the light to give her enough illumination and shape definition. To look at the setup another way: imagine my subject is in the middle of an analog clock. The black backdrop (which are IKEA curtains on my DIY hanger) is at 12 o'clock, and the camera is at 6 o'clock. The main light is at about 5 o'clock, and the two rim lights are at 2 and 10 o'clock. She also held a long piece of flexible aluminum duct that we wound around her and which caught and reflected the light, contrasting cool metal with warm skin tones. You can see more images in my Spiral Bound set on Flickr, though not if you don't have a Flickr account. You can also find them in my Tumblr feed; scroll down a bit. I wrote a short review of the Neewer TT560 flash on Amazon. 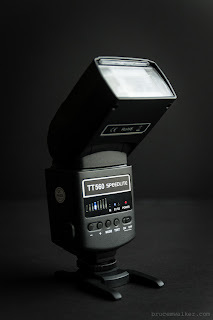 I bought two of these inexpensive flashes shortly before Christmas and I made good use of them during my most recent studio shoot, primarily for hard rim-light on my subject and prop.